Cut the feta cheese and watermelon into 24 cubes of approximately the same size. Wash and separate the individual mint leaves. 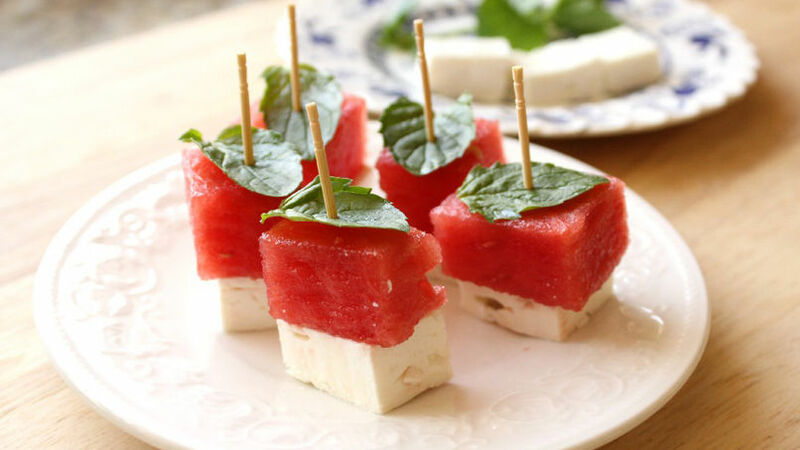 Slide 1 mint leaf, 1 watermelon and 1 feta cheese cube onto a toothpick. Assemble remaining appetizers. Try preparing kebabs using the same ingredients with 3 watermelon and cheese cubes, and mint leaves. If you’re looking for fresh appetizer ideas, these watermelon and feta cheese toothpick snacks are the perfect solution. With just 3 ingredients and a few minutes, you can delight your family and friends with a delicious appetizer that brings together different flavors in one bite. The presentation is colorful and makes serving a breeze, thanks to the toothpicks. Be inspired and prepare these toothpick snacks today!